In my last article, the reader could see that every Catholic has the right to resist commands and teachings of the ecclesiastical authority when they are in error and harm the Holy Church or the common good. In it are excerpts from very authoritative authors, among them St. Thomas Aquinas, St. Augustine and St. Robert Bellarmine, who hold that the faithful have the right and the duty to resist authority, and that the latter should receive such resistance and admonishments with the same spirit of humility that St. Peter received the famous reprimand of St. Paul (Gal 2:11). Departing from this exceptional example, the authors do not retreat before the possibility of a Pope who could fall into error or heresy or try to destroy the Church, and for this reason, merit the resistance and admonitions of the faithful. The considerations of these authors are not academic hypotheses, elaborated behind closed doors in scholarly theological disputes. They are well grounded in the History of the Church. Without being too concerned about documentation, I will briefly cite some cases of errors or heresies of Popes in the past and of the resistance that they raised. I leave open the possibility of returning to deal with these incidents in a more detailed and minutely documented way, should it be necessary. 1. 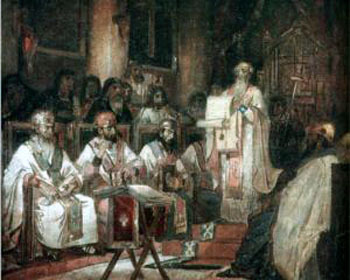 In the second century, the rites of the Church still were not fixed. There was a natural tendency to maintain the Judaic rites. The Roman Empire, dominant in almost the whole known world, exercised a strong influence. There was also the Greek influence present principally in Egypt and Syria. With this, a question understandably presented itself to the Church. Which of these influences should the liturgical rite follow? Pope St. Anicetus (155-168) wanted to regularize the rites of the Church, initiating what would come to be the Roman Rite. St. Polycarp of Smyrna, a disciple of St. John the Evangelist, wanted to keep the same rites that he had learned from St. John and that had been followed by the other Apostles. St. Polycarp traveled from the East to Rome and spoke firmly to St. Anicetus, opposing that planned uniformization. St. Polycarp was intransigent. St. Anicetus could not manage to persuade him of his reform. The two rites were maintained, because of the resistance of the great Bishop of Smyrna. St. Polycarp, along with St. Clement of Rome, the Pope and St. Ignatius of Antioch are each honored with the singular title of Apostolic Father, that is, among the great apologists of the Church these great Saints were instructed by one or another of the Apostles. 2. In the year 190, a similar question arose. Pope St. Victor (189-199) suffered the provocations of Blastus, a Catholic of the Jewish race who went to Rome with the intention of provoking a schism in the Church over the celebration of the Easter rites. Pope Victor had decided to resolve the problem by making a uniform rite to be followed under the threat of excommunication. All the Churches agreed, with the exception of the Asian Church, which at that time was very numerous. 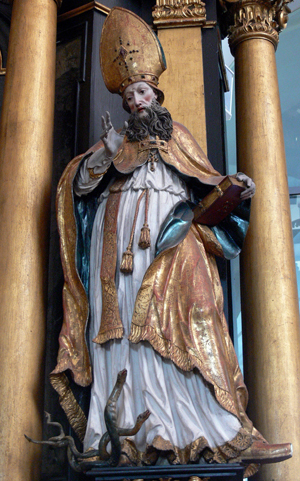 St. Irenaeus, an Asian who had moved to Lyons (France) and became its Bishop, opposed the decision of the Pope, and presented himself before Pope St. Victor to show him all the evils that could come for the Church with the possible schism of the Asian Church. The resistance of St. Irenaeus had the desired effect, and Pope Victor, while maintaining the general rule for the rest of the Church, opened an exception for the Asians. 3. A more serious and sad case was that of Pope Marcellinus (296-304), which took place in the years 303-304. It is not a case of resistance per se, but the precedence of a Pope who fell into an error contrary to Catholic Doctrine. There is no account of resistance to this action, but one can well imagine that the heroic Catholics who were disposed to offer their lives as martyrs to avoid the crime of Marcellinus strongly opposed that shameful defection of the Supreme Pontiff. 4. The epoch of Pope Liberius (352-366) in the middle of the 4th century was marked principally by three men. The Roman Emperor Constantius II, son of Constantine, directed the semi-Arian persecutions. St. Athanasius, Patriarch of Alexandria, and St. Hilary, Bishop of Poitiers, resisted the Emperor. At first, Liberius took a strong, laudable stance supporting the Bishops who had resisted the Emperor and were exiled for refusing to sign semi-Arian decrees. 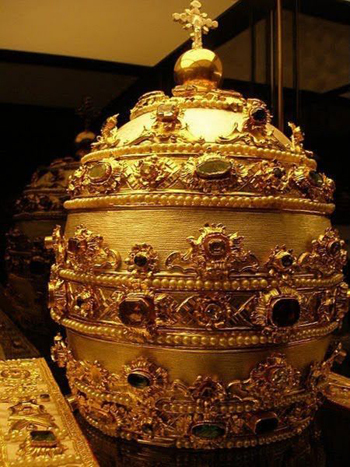 In view of this, Constantius ordered the Pope to be arrested and submitted him to pressures to intimidate him. Since the Pope remained constant up to this point, he was sent in exile to Thrace. Then Constantius had Felix elected to occupy the Chair of Peter. This exile was more difficult for Liberius to endure than the other pressures. After some time, he submitted to the desires of the Emperor. Four letters preserved by St. Hilary of Poitiers in his Historical Fragments and his work Ad Constantium contain the testimony of the Pope's submission to the semi-Arian Emperor. St. Athanasius also left a record of the papal defection in his History of the Arians and his Apologia against the Arians. It is interesting to note that neither St. Athanasius nor St. Hilary had any problem in resisting the Arian politics of Pope Liberius. It is largely from the writings of these two saints that the heresy of Pope Liberius is known today. 5. At the beginning of the 5th century, St. Augustine, Bishop of Hippo, St. Aurelius, Archbishop of Carthage, and St. Jerome in Bethlehem were shining lights in North Africa and Asia Minor. At that time, the Church was afflicted with the Pelagian heresy. The doctrine of Pelagius was first condemned by the Council of Carthage in 411. Afterward, it gave rise to the great polemic of St. Jerome and Orosius in Jerusalem, where the heretic had established an important base. 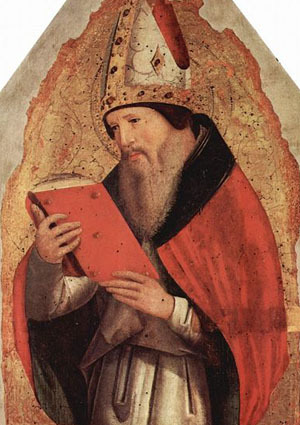 St. Augustine wrote various books against the Pelagian doctrine: The Remission of Sins and the Baptism of Children, the Spirit and the Letter, Letter to Hilary, Nature and Grace, Perfect Justice, The Acts of Pelagius, The Grace of Christ and Original Sin. Alongside these intellectual efforts, the Bishop of Hippo and the Bishop of Carthage exercised their influence so that the two African Councils of Carthage and Mileve held in 416 condemned the Pelagian doctrine and its promoters. This papal support for Pelagius can also be found in the Letter Magnum pondus. In addition to this inconceivable position, the Holy See demanded a formal retraction from the African Bishops. The African Bishops appealed, asking Rome to take into consideration the prior condemnation of Pope Innocent I and the two councils of Carthage. The request was unheeded. In face of this situation, St. Augustine and St. Aurelius made an energetic protestation, or obtestatio – an oath with God as witness – affirming that the prior Catholic Doctrine prevailed over the judgment of Zosimus. A plenary council of all Africa then assembled to uphold the condemnation made by Pope Innocent I against Pelagius. Finally, Pope Zosimus, breaking with his prior measures, accepted the condemnation of Innocent I and renewed the excommunication of Pelagius. This precedent remains in History as a brilliant example of resistance. 6. Vigilius, the papal representative at Constantinople, was a kind of puppet of the Empress Theodora. He was the one who gave the order to Belisarius, one of the principal generals of Justinian, to depose Pope Silverius (536-537). Silverius was exiled to Asia, returned to Rome, and then newly exiled to the Island of Palmaria where he died, abandoned. After the death of Silverius, Vigilius himself was raised to the Pontifical Throne (537-555). At that time, the question of the “Three Chapters” was a much-discussed topic. In summary, this referred to the Council of Chalcedon, which condemned the heresy of Eutyches, Monophysitism. To condemn the “Three Chapters” was equivalent to condemning the Council of Chalcedon and approving Monophysitism. The Emperor Justinian wanted the Council of Chalcedon to be condemned. At first, Pope Vigilius took a firm position. For this, he was made prisoner and exiled to Constantinople. After years of struggle, in which he suffered ridicule and physical violence, Vigilius gave in. On the orders of Justinian, a new council of Constantinople was convoked and the “Three Chapters” were condemned, that is to say, Monophysitism was accepted. Vigilius, who wanted to end his exile, asked Justinian for permission to return to Rome. The Emperor agreed, with the condition that the Pope would approve the decisions of the recent council. Vigilius pulled back from his former orthodox position, wrote a letter of retraction, condemned the “Three Chapters” and launched an anathema against its authors. After this reconciliation with Justinian, Vigilius was rewarded with concessions that would have allowed him to reorganize the government of Rome and Italy. He left Constantinople, but he never carried out his plans because he died before he reached Rome. This is a brief account of six historical precedents that illustrate errors of Popes in the past and the consequent possibility of opposing them with a legitimate and salutary resistance. Three interesting cases still remain, which will be dealt with in the next article. Can a Pope Err in Doctrinal & Liturgical Matters? When Does a Heretical Pope Become an Invalid Pope? Is the Council under Suspicion of Heresy?